The TV on the Lazy Daze mid-bath floorplan is above the couch on the driver’s side, on the backside of the shower wall. 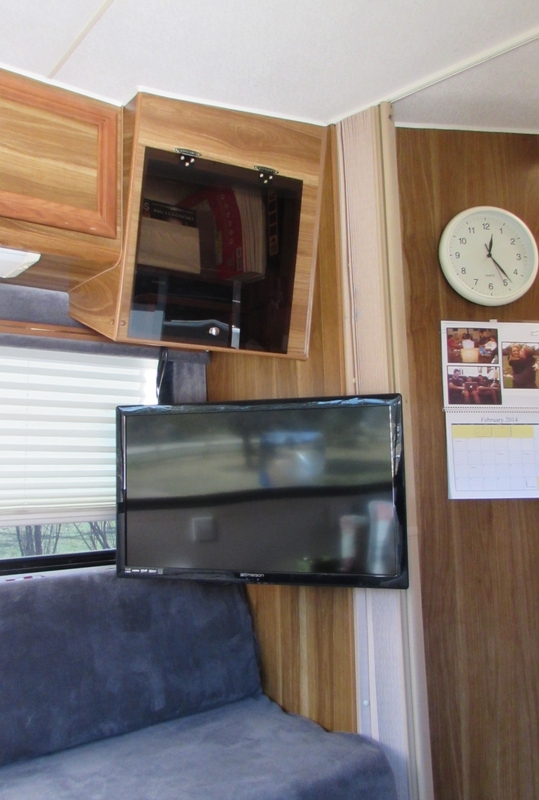 Of course, since I am the queen of not taking a before shot, I had to find a picture (of a different floorplan) from the Lazy Daze site showing a similar overhead TV cabinet in a new motorhome. Photo of a new Lazy Daze (rear kitchen plan) showing the overhead TV cabinet with flat-panel TV attached. I really hated the high TV. It was literally a pain in the neck to watch at that angle. I wanted to try to put a flip-up table in the back corner, like in my prior rig. Running the cable and power to it would be a challenge, though. Or maybe attach it to the wall behind the shower. We found that there was a stud along the corner of the wall, next to the folding accordion door, that we could use to attach a TV mount to. I had found a very light LED TV at Walmart that weighs only about 10 pounds. It could certainly attach to that stud on a swing arm TV mount. I had to remove a magazine holder/rack thingy from the wall, but that was easy enough to do. I ordered the swing-arm mount from Walmart. They didn’t have the right kind in the stores, so had to order it online. 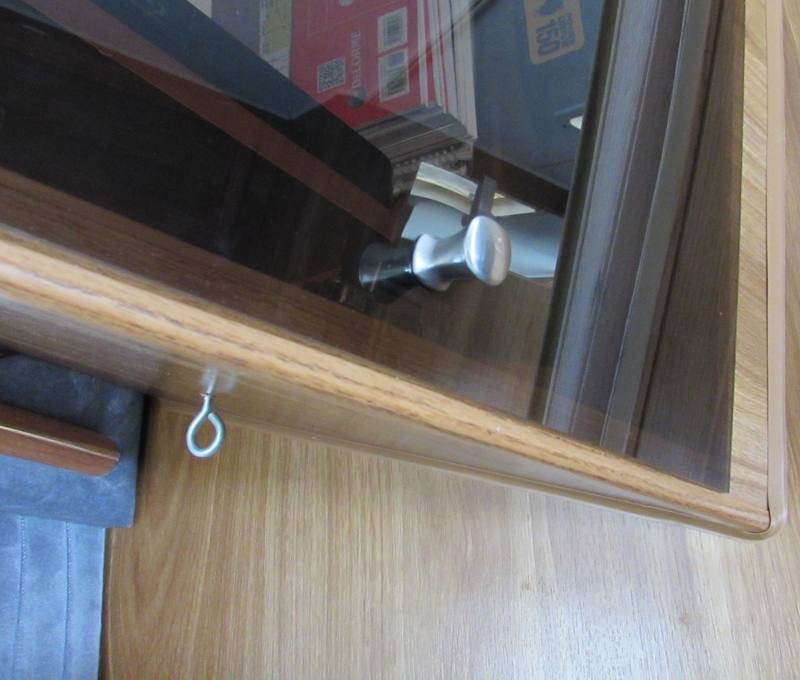 After removing the mounting hardware for the prior TV we were left with an odd shaped cabinet. I thought that if we mounted the TV on the wall then the cabinet could be used for storage. I envisioned a small shelf coming off of the slanted portion for a DVD player, and a shelf above it against the back wall to put books or DVDs or whatever there. 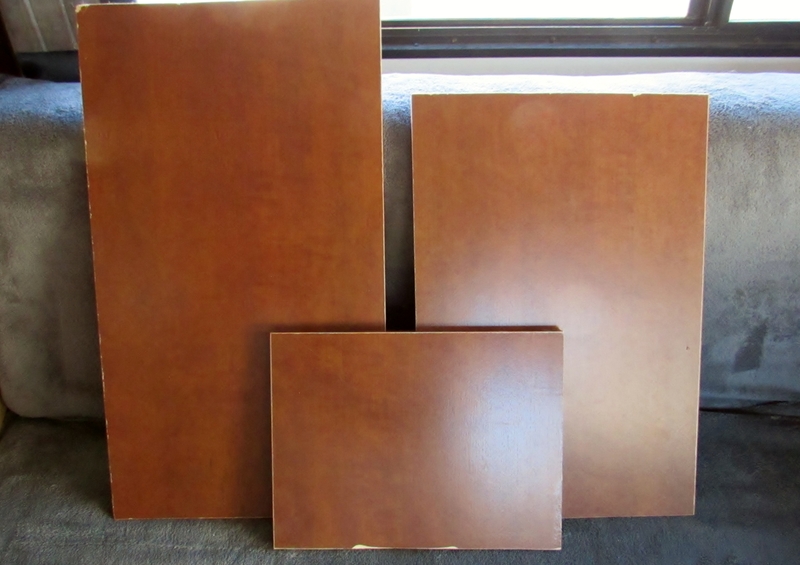 We discussed having a cabinet door built and stain it to match as close as possible. Then I thought it would be good to get a piece of black plexiglass, like on a real entertainment cabinet. Neighbor Alan had a piece from some project he had worked on so he brought it over and it seemed like a similar type piece, cut to fit, would work well. I was able to find a plastics shop in Austin that could cut me a piece of grey smoke plexiglass for $15, so arranged for that on my next trip to town. One shelf becomes three – the longest one for the dinette, small and medium ones for the TV cabinet. So I stained the bare wood on the bottom of the cabinet and Dad cut some triangular pieces to attach the DVD shelf. That was one of the hardest parts of the project. 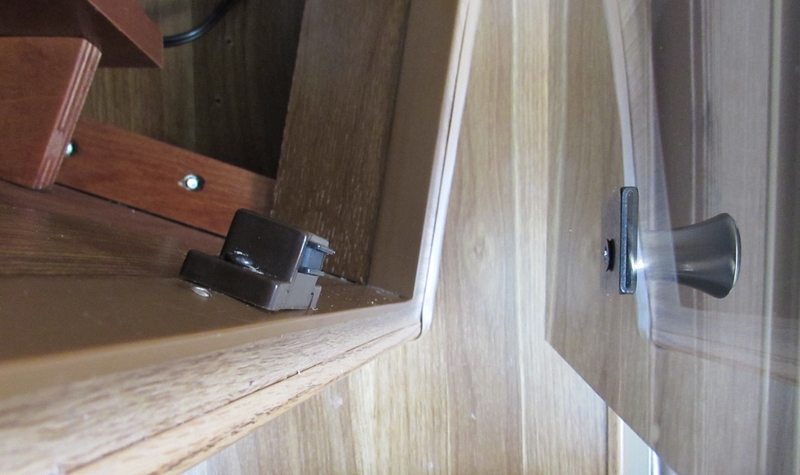 Getting the angle right on those triangles was tough, since the slant of the cabinet is really wacky. Eventually we got the shelf really close to level. The longer shelf piece hangs off a short platform at the back of the cabinet. Again, it took a little bit of getting angles right for the two wooden block shelf supports that sit on that slanting base. But, when it was done, the shelves looked and worked great. 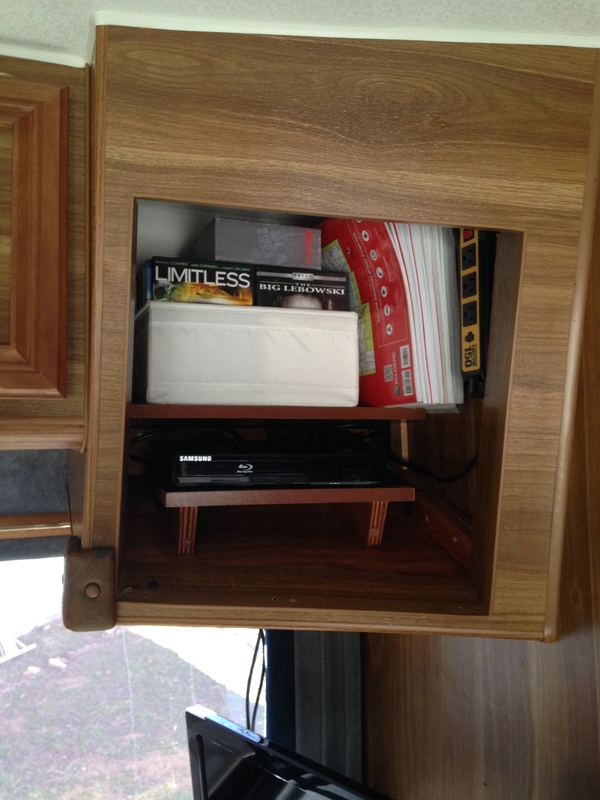 I mounted my 12-volt power-strip inverter in the cabinet so that I can run the TV and DVD player when off grid. 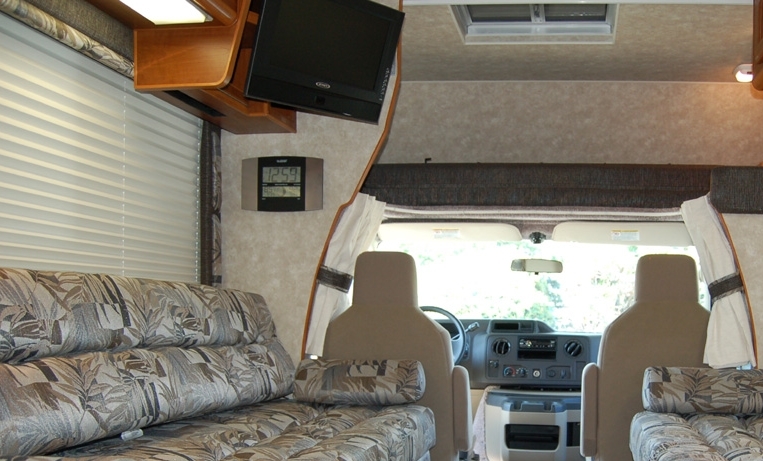 The 12-volt plug is in the cabinet to the left of this one, with the cable/antenna booster switch outlet. The cabinet ended up being a good spot for my DeLorme and Benchmark atlas books. They are extra tall and the right side of the cabinet is extra long. I was worried about the stuff in there falling during travel, but it’s packed in tight and nothing moves. And the DVD player sits on a piece of no-skid material on its shelf. I think it turned out pretty darn well. If I had it to do over again I would buy a smaller TV. It’s 28″ and a little big for the living room space. It does fit nicely when back against the wall, resting gently on the top of the couch. 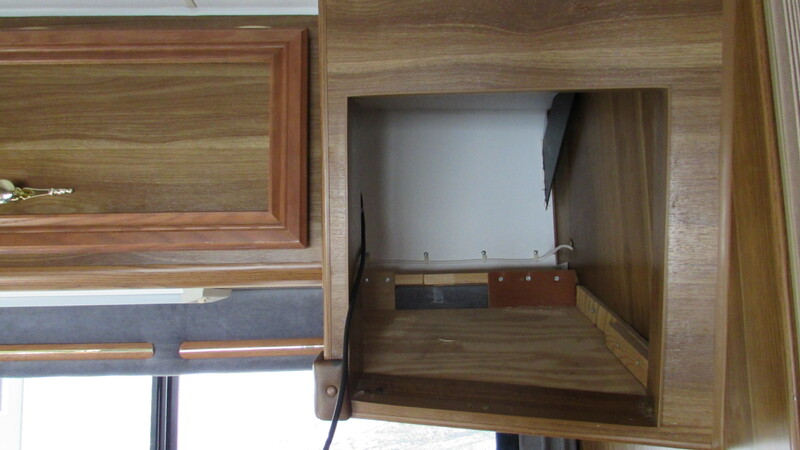 I added the eye-hook under the cabinet to attach additional support during travel. 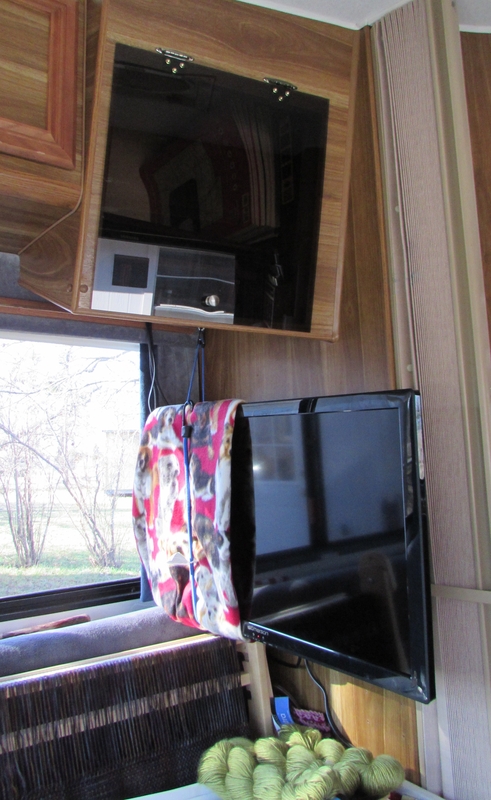 I wrap the TV with a fleece throw and attach a couple of bungee cords. I like to have it nice and snug while in motion. Travel Mode. My loom folds up and travels on the couch under the TV, with my yarn basket. And there it is. A great entertainment setup. 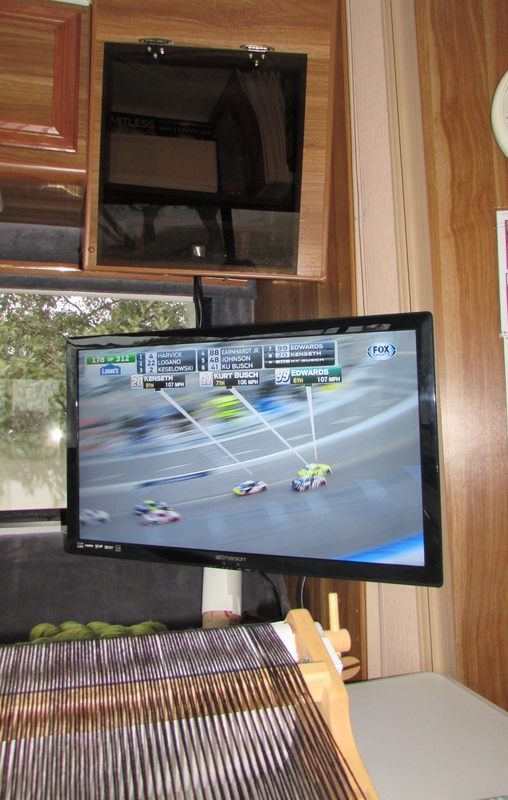 Watching a race and weaving a shawl on my fold-up table. Life is good. 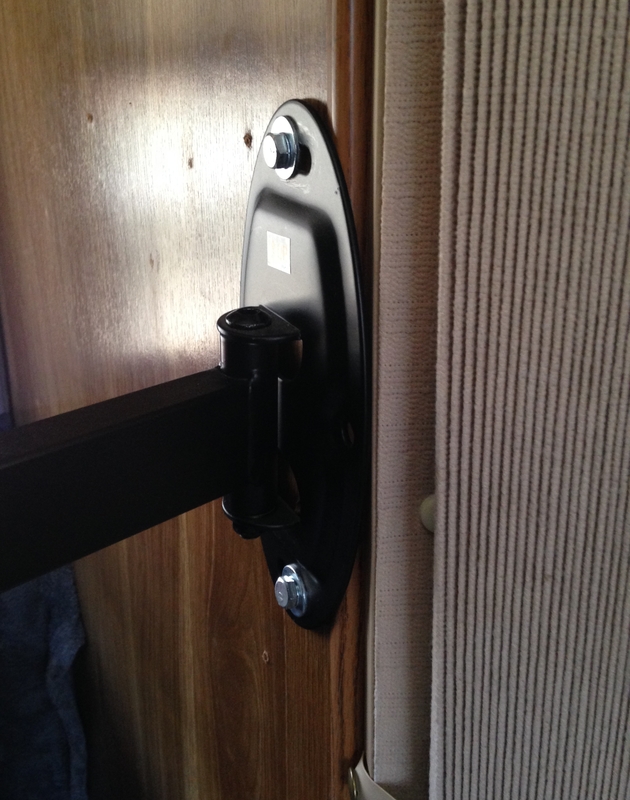 This entry was posted in Lazy Daze, RV Systems, Upgrades and tagged Lazy Daze upgrade, RV TV Mount by ontheroadwithriley. Bookmark the permalink. 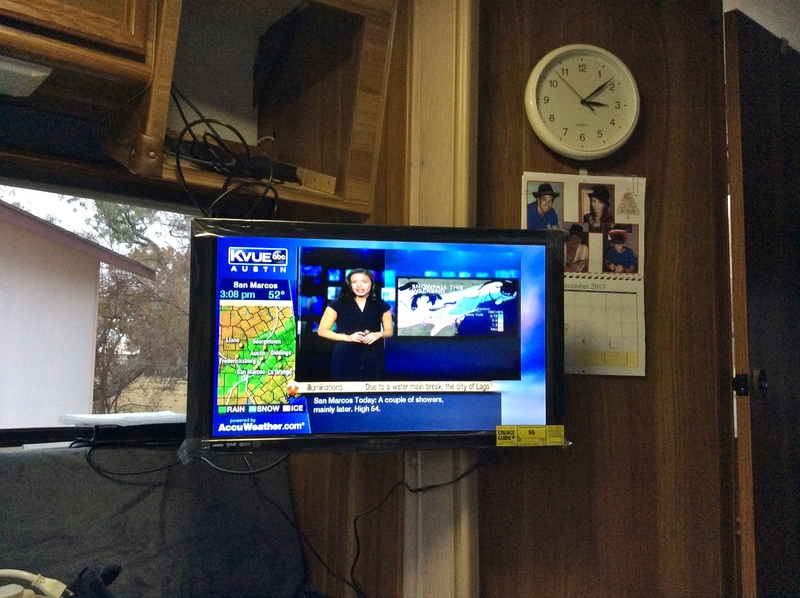 You did a beautiful job of mounting your TV! Ahhh…a race, a window, and a project. Very good indeed. Thanks Barbara! Hope to get a chance to cross paths at NM state parks this summer! Two great blogs. You are really getting good at this. Very nicely done. That TV cabinet is an odd one; but, you did a good job of making it functional. Take care. Thanks! That TV cabinet is one that a LOT of Lazy Daze folks have had to modify in some manner.